November 21 - December 19, 2015. Jonathan LeVine Gallery is pleased to present INVENTORY, new works by Los Angeles-based artist Augustine Kofie, in his first solo exhibition at the gallery. 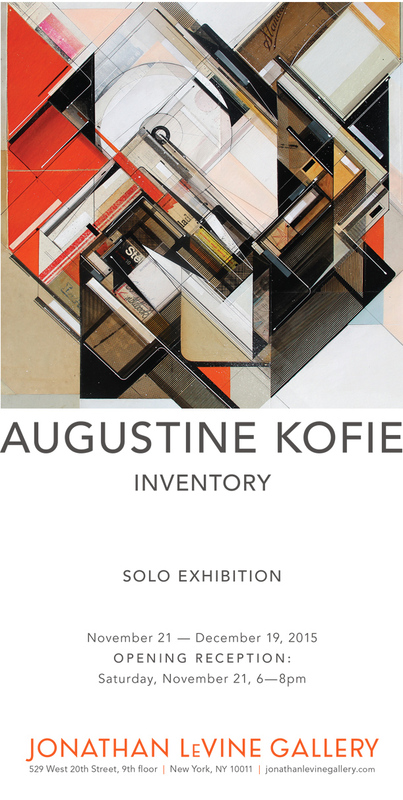 In the exhibition, Kofie explores the role of inventory in his work. The word inventory, “a complete list of items such as property, goods in stock, or contents of a building,” comes into English from the Late Latin inventarium, a “list of what is found,” from the Latin invenire, “to devise, discover, find.” Invention and inventory are thus linked: the making of something new comes from the discovery of something existent, its subsequent cataloguing, storing, and use as stock. The inventory in question consists of found, reclaimed press- or chip-board, a heavier paper stock used in packaging and office supplies from the 1950s to the 1980s: steno notepads, file folders, envelopes, index cards, or industrial packaging designed, printed and manufactured in the USA. These are old technologies, now rendered obsolete, used for organizing in a predigital, bygone era. Kofie finds and collects these at estate sales in the greater Los Angeles area in a highly specific form of “controlled hoarding,” in the artist’s own words. He gleans this refuse of the past—forgotten, unwanted, unseen—from the homes, workshops, and garages of the elderly, who saved everything, back when things were made well, made to last. Kofie explains his attraction to office supplies through his obsessiveness with organization, not order so much as cataloging. A self-defined “compartamentalizer,” he breaks his work process into phases, especially for a cohesive, coherent collection such as the one in this exhibition. He begins by drawing small case studies on notepaper or note pads—loose leafed, easily discardable. These become reference for collage work, in which the discovery and collection of forsaken materials is the first step. Next, the materials enter his studio, where they are meticulously inventoried—archived by color palette, thickness, and category in vintage industrial file cabinets, “sometimes for years, sometimes for that day,” until they make their way into an assemblage. Finally, layers of pencil, ballpoint pen, silkscreen, and acrylic ink cover the assemblage, making it cohere. This method of citing systems that have existed in the past—the process of discovering, isolating, and repurposing in something existent a component of new creative possibility—defines sampling. A parallel version of the process forms the basis of Kofie’s soundtracks for his exhibitions (under the moniker 4X4Tracktor), many of which sample records found at the same estate sales as well as marginal cinema from the same era. But whereas sampling poaches bits of work made by other artists, amassing and repurposing an inventory of predigital office supplies does not infringe on anyone’s creative copyright. Flipping the materials becomes an act of elevation, of salvage from oblivion. INVENTORY focuses on reappropriation as the very beginning of Kofie’s work.